First off, I want to thank everyone for all of your amazing comments and emails. I was kind of worried posting that letter, because I wasn't sure how it would be received. However, your replies just confirmed what intelligent, caring, compassionate, awesome people you all are! I love retro fabrics, prints, colors, etc. Today, when I was looking at the local antique store after lunch, I came across some really awesome vintage fabrics, and today's nail design was inspired by one of them! I didn't buy it, but I did end up buying a cute leather 70s handbag for $15. WOO! I used American Apparel Cotton as a base, with Essie Alligator Purse and American Apparel Hassid for the design. Topped it all off with 2 coats of Seche Vite top coat. Gorgeous nails (as usual)! Would LOVE to see the handbag!! First wanted to say great, fun nails, as always. I know exactly what you mean about those retro fabrics, they're fab! Next, I agree, show us your new bag, I've never had much luck vintage shopping, so I love to see what other people 'score'. Just read the comments on the Color Club post, which I'm guessing was the straw that... well... pissed you off, well maybe it didn't piss you off, but it pissed me off. Anyway, I wanted to say that I actually hadn't seen that press release yet when I spied it on your site, and I appreciate the preview, it gets us excited about what's coming our way! So I say - bring 'em on if you want! I've been spending much of my study time procrastinating and whiling away time at your blog, gawking at all the fabulous nail designs from the 365-day project.. experimenting on my own. Inspiring!! And impossible to replicate! If I need a smile, or a little sparkle in my day, I head over to this blog. :) Just wanted you to know! Fun nails as always. You are an out-there star in the nail-art nailiverse! OMG I just went back and looked at your letter and THEN at the Preview. I noticed the hostile comment was from jen. I scooted right back here and with relief realised I am jaljen here. Because I am jen on some blogs depending on which account I signed in on. So to some people I appear as jen on GFC. But I never post anonymously and it certainly wasn't me. There are quite a few jens about so I'm sorry for them too. I don't understand why, if people have a strong view, they aren't honest and post openly with an ID. Well, I do understand but it's pathetic. Don't be worried! We love you! Cool design! I also like the more rounded nails. 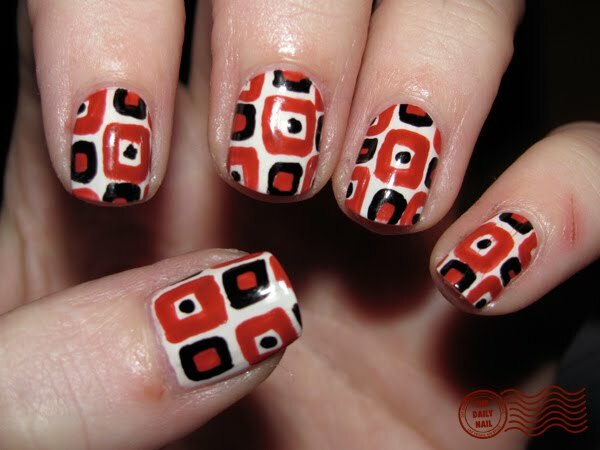 Did you do your 'Pizza' nails after your 'REDtro' nails?? The cut on your pinky looks worse in the REDtro one even though it's done after wards lol!! Cheers very much for expressing this valuable data. I'd personally undoubtedly such as.